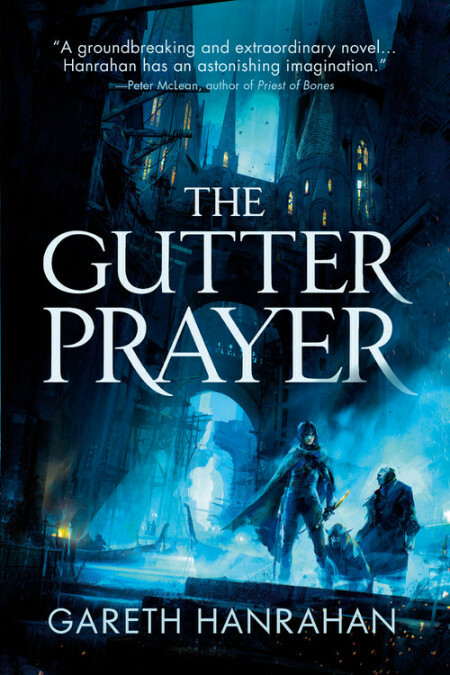 The Page 69 Test: "The Gutter Prayer"
[Jere] has no intention of getting that close to his prisoner. He has too much respect for the Stone Man’s strength. Anyway, hunger might push the boy into giving up Heinreil. Spar drags himself over to the water’s edge, fearful of slipping on the slimy rocks and sliding into the depths. He fishes the soaked package out of the water. The wet paper rips under his grasp, and chunks of bread float out across the green sea. “Feel like talking?” asks Jere. Spar sits down with his great granite back to the thief-taker, and starts to eat what remains of the already-paltry meal. “I’ll be back this evening,” calls Jere, and paddles back to shore. He checks the box of alkahest syringes in his office before leaving. Just one left. He’ll need to find more. Jere prides himself on being able to break the will of the toughest prisoner, but this is Idge’s son. Idge, who defied the city and the watch and took the noose to protect the Brotherhood he founded. The Thay girl’s file is still on his desk. He picks it up and leafs through it in irritation. A day wasted on a spoiled runaway who doesn’t know the first thing about the Brotherhood. Still, the Professor owes him a favour, so it’s not a total loss. He shoves the file into a cubbyhole, and takes the ledger of births and deaths from the ruined hall of records with him. He’s not sure what to do with it – officially speaking, he shouldn’t have removed it in the first place, but he’s learned to trust his luck. Finding the relevant records intact, instead of incinerated with all the rest – it has to mean something, even if he can’t discern what that is yet. Jere’s next appointment is at a coffee house on Venture Square. It’s an upmarket place, so he pulls his good coat on over his leathers. He leaves the hook staff hanging on the coat stand, and instead takes a sturdy walking stick with a hidden blade. The coat has nice big pockets, big enough to hide a small gun, big enough to hide Jere’s own hands, with all their scars and calloused knuckles. So, page 69 has Jere the Bounty Hunter trying to break the will of his prisoner, Spar. On the one hand, Jere’s got the upper hand – Spar’s got the stone plague, and will slowly, agonisingly turn into a statue unless Jere supplies him with the alkahest drug. On the other, enduring hardship and embracing martyrdom plays right into Spar’s strengths. Rebuffed, Jere looks at some records – I love that this cropped up on this page, research and deduction are so important to the story. Also, Jere’s intuition that the document “has to mean something, even if he can’t discern what” has added resonance in a story with active, interventionist gods who work their will through miracles and co-incidences. Finally, Jere leaves for his appointment with Effro Kelkin, the leader of the opposition in Parliament. Jere’s a bridge between the street-level action of the thieving protagonists, and the high-level intrigue of guilds and gods. He connects the braids of narrative, so when the story goes from the story of three criminals on the run to fate-of-the-city weirdness, it’s not a jarring shift – we’ve already been introduced to some of the main players in city politics. Not a whole load of action on this page, but it’s a nice cross-section of three key strands – the thieves’ guild, research into the city’s history, and political machinations. 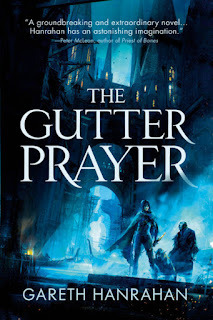 Add in a few godspawned horrors and an alchemical explosion or two, and that’s The Gutter Prayer!